Increased heat, drought, and insect outbreaks, all linked to climate change, have increased wildfires. Declining water supplies, reduced agricultural yields, health impacts in cities due to heat, and flooding and erosion in coastal areas are additional concerns. 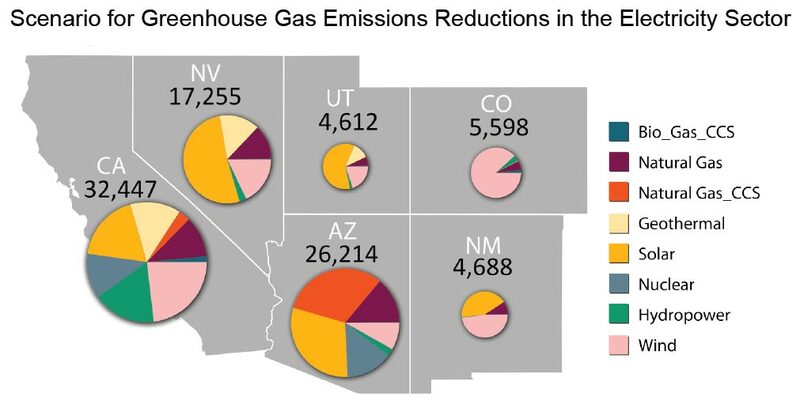 Explore how climate change is affecting the Southwest. The Southwest is the hottest and driest region in the United States, where the availability of water has defined its landscapes, history of human settlement, and modern economy. Climate changes pose challenges for an already parched region that is expected to get hotter and, in its southern half, significantly drier. Increased heat and changes to rain and snowpack will send ripple effects throughout the region’s critical agriculture sector, affecting the lives and economies of 56 million people – a population that is expected to increase 68% by 2050, to 94 million.5 Severe and sustained drought will stress water sources, already over-utilized in many areas, forcing increasing competition among farmers, energy producers, urban dwellers, and plant and animal life for the region’s most precious resource. The region’s populous coastal cities face rising sea levels, extreme high tides, and storm surges, which pose particular risks to highways, bridges, power plants, and sewage treatment plants. Climate-related challenges also increase risks to critical port cities, which handle half of the nation’s incoming shipping containers. Agriculture, a mainstay of the regional and national economies, faces uncertainty and change. The Southwest produces more than half of the nation’s high-value specialty crops, including certain vegetables, fruits, and nuts. The severity of future impacts will depend upon the complex interaction of pests, water supply, reduced chilling periods, and more rapid changes in the seasonal timing of crop development due to projected warming and extreme events. Climate changes will increase stress on the region’s rich diversity of plant and animal species. Widespread tree death and fires, which already have caused billions of dollars in economic losses, are projected to increase, forcing wholesale changes to forest types, landscapes, and the communities that depend on them (see also Ch. 7: Forests). Tourism and recreation, generated by the Southwest’s winding canyons, snow-capped peaks, and Pacific Ocean beaches, provide a significant economic force that also faces climate change challenges. The recreational economy will be increasingly affected by reduced streamflow and a shorter snow season, influencing everything from the ski industry to lake and river recreation. 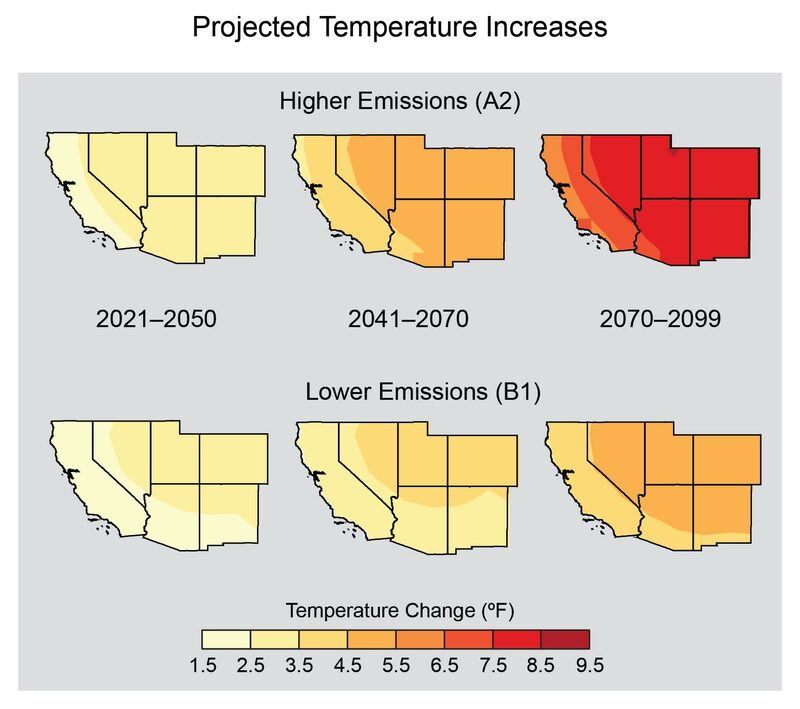 Regional annual average temperatures are projected to rise by 2.5°F to 5.5°F by 2041-2070 and by 5.5°F to 9.5°F by 2070-2099 with continued growth in global emissions (A2 emissions scenario), with the greatest increases in the summer and fall (Figure 20.1). If global emissions are substantially reduced (as in the B1 emissions scenario), projected temperature increases are 2.5°F to 4.5°F (2041-2070), and 3.5°F to 5.5°F (2070-2099). Summertime heat waves are projected to become longer and hotter, whereas the trend of decreasing wintertime cold air outbreaks is projected to continue (Ch. 2: Our Changing Climate, Key Message 7).16,17 These changes will directly affect urban public health through increased risk of heat stress, and urban infrastructure through increased risk of disruptions to electric power generation.18,19,20,21,22,23,24 Rising temperatures also have direct impacts on crop yields and productivity of key regional crops, such as fruit trees. Projections of precipitation changes are less certain than those for temperature.1,25 Under a continuation of current rising emissions trends (A2), reduced winter and spring precipitation is consistently projected for the southern part of the Southwest by 2100 as part of the general global precipitation reduction in subtropical areas. In the northern part of the region, projected winter and spring precipitation changes are smaller than natural variations. Summer and fall changes are also smaller than natural variations throughout the region (Ch. 2: Our Changing Climate, Key Message 5).1 An increase in winter flood hazard risk in rivers is projected due to increases in flows of atmospheric moisture into California’s coastal ranges and the Sierra Nevada (Ch. 3: Water).26,27 These “atmospheric rivers” have contributed to the largest floods in California history28 and can penetrate inland as far as Utah and New Mexico. The Southwest is prone to drought. Southwest paleoclimate records show severe mega-droughts at least 50 years long.29,30,31 Future droughts are projected to be substantially hotter, and for major river basins such as the Colorado River Basin, drought is projected to become more frequent, intense, and longer lasting than in the historical record.25 These drought conditions present a huge challenge for regional management of water resources and natural hazards such as wildfire. In light of climate change and water resources treaties with Mexico, discussions will need to continue into the future to address demand pressures and vulnerabilities of groundwater and surface water systems that are shared along the border. The Southwest’s 182 federally recognized tribes and communities in its U.S.-Mexico border region share particularly high vulnerabilities to climate changes such as high temperatures, drought, and severe storms. Tribes may face loss of traditional foods, medicines, and water supplies due to declining snowpack, increasing temperatures, and increasing drought (see also Ch 12: Indigenous Peoples).32,33 Historic land settlements and high rates of poverty – more than double that of the general U.S. population34 – constrain tribes’ abilities to respond effectively to climate challenges. A central component of the assessment process was the Southwest Regional Climate assessment workshop that was held August 1-4, 2011, in Denver, CO with more than 80 participants in a series of scoping presentations and workshops. The workshop began the process leading to a foundational Technical Input Report (TIR) report.41 The TIR consists of nearly 800 pages organized into 20 chapters that were assembled by 122 authors representing a wide range of inputs, including governmental agencies, non-governmental organizations, tribes, and other entities. The report findings were described in a town hall meeting at the American Geophysical Union’s annual fall meeting in 2011, and feedback was collected and incorporated into the draft. Over the past 50 years, there has been a reduction in the amount of snow measured on April 1 as a proportion of the precipitation falling in the corresponding water-year (October to September), which affects the timing of snowfed rivers. The implication of this finding is that the lower the proportion of April 1 snow water equivalent in the water-year-to-date precipitation, the more rapid the runoff, and the earlier the timing of center-of-mass of streamflow in snowfed rivers.43,44 For the “recent decade” (2001 to 2010), snowpack evidence is from U.S. Department of Agriculture (USDA) Natural Resources Conservation Service snow course data, updated through 2010. One study5 has analyzed streamflow amounts for the region’s four major river basins, the Colorado, Sacramento-San Joaquin, Great Basin (Humboldt River, NV), and the Rio Grande; data are from the U.S. Department of the Interior – Bureau of Reclamation, California Department of Water Resources, U.S. Geological Survey, and the International Boundary and Water Commission (U.S. Section), respectively. These data are backed by a rigorous detection and attribution study.15 Projected trends25 make use of downscaled climate parameters for 16 global climate models (GCMs), and hydrologic projections for the Colorado River, Rio Grande, and Sacramento-San Joaquin River System. Future flows in the four major Southwest rivers are projected to decline as a result of a combination of increased temperatures, increased evaporation, less snow, and less persistent snowpack. These changes have been projected to result in decreased surface water supplies, which will have impacts for allocation of water resources to major uses, such as urban drinking water, agriculture, and ecosystem flows. Different model simulations predict different levels of snow loss. These differences arise because of uncertainty in climate change warming and precipitation projections due to differences among GCMs, uncertainty in regional downscaling, uncertainty in hydrological modeling, differences in emissions, aerosols, and other forcings, and because differences in the hemispheric and regional-scale atmospheric circulation patterns produced by different GCMs produce different levels of snow loss in different model simulations. In addition to the aforementioned uncertainties in regional climate and hydrology projections, projection of future surface water supply reliability includes at least the following additional uncertainties: 1) changes in water management, which depend on agency resources and leadership and cooperation of review boards and the public;37 2) management responses to non-stationarity;38 3) legal, economic, and institutional options for augmenting existing water supplies, adding underground water storage and recovery infrastructure, and fostering further water conservation (for example, Udall 201339); 4) adjudication of unresolved water rights; and 5) local, state, regional, and national policies related to the balance of agricultural, ecosystem, and urban water use (for example,40). 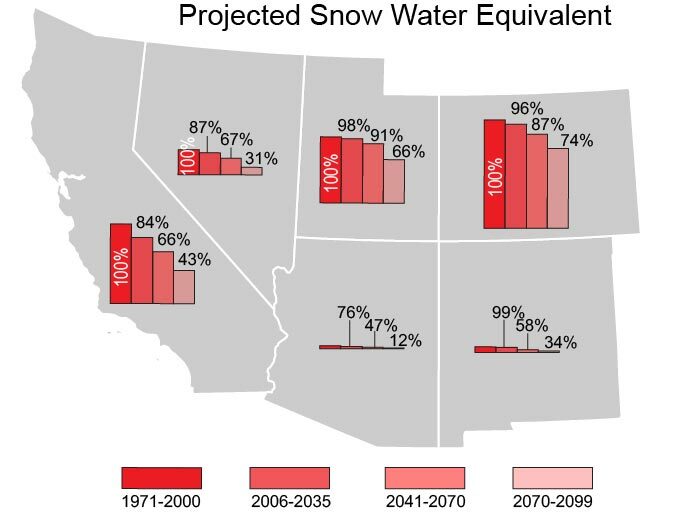 There is high confidence in the continued trend of declining snowpack and streamflow in parts of the Southwest given the evidence base and remaining uncertainties. For the impacts on water supply, there is high confidence that reduced surface water supply reliability will affect the region’s cities, agriculture, and ecosystems. Winter snowpack, which slowly melts and releases water in spring and summer, when both natural ecosystems and people have the greatest needs for water, is key to the Southwest’s hydrology and water supplies. Over the past 50 years across most of the Southwest, there has been less late-winter precipitation falling as snow, earlier snowmelt, and earlier arrival of most of the year’s streamflow.43,44 Streamflow totals in the Sacramento-San Joaquin, the Colorado, the Rio Grande, and in the Great Basin were 5% to 37% lower between 2001 and 2010 than the 20th century average flows.5 Projections of further reduction of late-winter and spring snowpack and subsequent reductions in runoff and soil moisture46,47,50 pose increased risks to the water supplies needed to maintain the Southwest’s cities, agriculture, and ecosystems. Temperature-driven reductions in snowpack are compounded by dust and soot accumulation on the surface of snowpack. This layer of dust and soot, transported by winds from lowland regions, increases the amount of the sun’s energy absorbed by the snow. This leads to earlier snowmelt and evaporation – both of which have negative implications for water supply, alpine vegetation, and forests.51,52,53,54 The prospect of more lowland soil drying out from drought and human disturbances (like agriculture and development) makes regional dust a potent future risk to snow and water supplies. In California, drinking water infrastructure needs are estimated at $4.6 billion annually over the next 10 years, even without considering the effects of climate change.55 Climate change will increase the cost of maintaining and improving drinking water infrastructure, because expanded wastewater treatment and desalinating water for drinking are among the key strategies for supplementing water supplies. Increased competition for scarce water was presented in the first key message and in the foundational Technical Input Report (TIR).41 U.S. temperatures, including those for the Southwest region, have increased and are expected to continue to rise (Ch. 2: Our Changing Climate, Key Message 3). Heat waves have become more frequent and intense and droughts are expected to become more intense in the Southwest (Ch. 2: Our Changing Climate, Key Message 7). 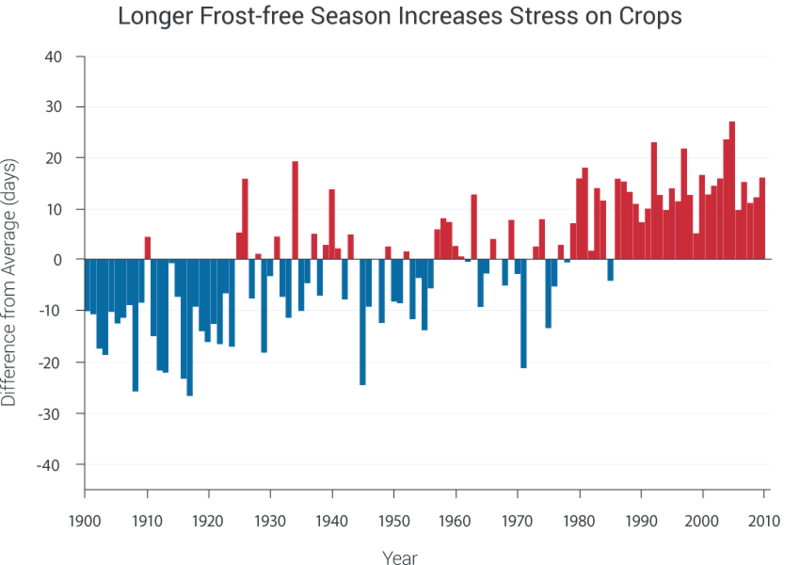 The length of the frost-free season in the Southwest has been increasing, and frost-free season length is projected to increase (Ch. 2: Our Changing Climate, Key Message 4). A regional study1 discusses the trends and scenarios in the Southwest for moisture, cold, heat, and their extremes. Irrigation water transfers to urban. Warmer, drier future scenarios portend large transfers of irrigation water to urban areas even though agriculture will need additional water to meet crop demands, affecting local agriculturally-dependent economies.75 In particular areas of the Southwest (most notably lower-central Arizona), a significant reduction in irrigated agriculture is already underway as land conversion occurs near urban centers.76 Functioning water markets, which may require legal and institutional changes, can enable such transfers and reduce the social and economic impacts of water shortages to urban areas.77 The economic impacts of climate change on Southwest fruit and nut growers are projected to be substantial and will result in a northward shift in production of these crops, displacing growers and affecting communities. Competition for water is an uncertainty. The extent to which water transfers take place depends on whether complementary investments in conveyance or storage infrastructure are made. Currently, there are legal and institutional restrictions limiting water transfers across state and local jurisdictions. It is uncertain whether infrastructure investments will be made or whether institutional innovations facilitating transfers will develop. Institutional barriers will be greater if negative third-party effects of transfers are not adequately addressed. Research that would improve the information base to inform future water transfer debates includes: 1) estimates of third party impacts, 2) assessment of institutional mechanisms to reduce those impacts, 3) environmental impacts of water infrastructure projects, and 4) options and costs of mitigating those environmental impacts. Extremes and phenology. A key uncertainty is the timing of extreme events during the phenological stage of the plant or the growth cycle of the animal. For example, plants are more sensitive to extreme high temperatures and drought during the pollination stage compared to vegetative growth stages. Genetic improvement potential. Crop and livestock reduction studies by necessity depend on assumptions about adaptive actions by farmers and ranchers. However, agriculture has proven to be highly adaptive in the past. A particularly high uncertainty is the ability of conventional breeding and biotechnology to keep pace with the crop plant and animal genetic improvements needed for adaptation to climate-induced biotic and abiotic stresses. Because net reductions in the costs of water shortages depend on multiple institutional responses, it is difficult as yet to locate a best estimate of water transfers between zero and the upper bound. Water scarcity may also be a function of tradeoffs between economic returns from agricultural production and returns for selling off property or selling water to urban areas (for example, Imperial Valley transfers to San Diego). Given the evidence base and remaining uncertainties, confidence is high in this key message. Farmers are renowned for adapting to yearly changes in the weather, but climate change in the Southwest could happen faster and more extensively than farmers’ ability to adapt. The region’s pastures are rain-fed (non-irrigated) and highly susceptible to projected drought. Excluding Colorado, more than 92% of the region’s cropland is irrigated, and agricultural uses account for 79% of all water withdrawals in the region.79,69,70 A warmer, drier climate is projected to accelerate current trends of large transfers of irrigation water to urban areas,77,76,78 which would affect local agriculturally dependent economies. Winter chill periods are projected to fall below the duration necessary for many California trees to bear nuts and fruits, which will result in lower yields.71 Warm-season vegetable crops grown in Yolo County, one of California’s biggest producers, may not be viable under hotter climate conditions.72,84 Once temperatures increase beyond optimum growing thresholds, further increases in temperature, like those projected for the decades beyond 2050, can cause large decreases in crop yields and hurt the region’s agricultural economy. Increased warming and drought are extensively described in the foundational Technical Input Report (TIR).41 U.S. temperatures have increased and are expected to continue to rise (Ch. 2: Our Changing Climate, Key Message 3). There have been regional changes in droughts, and there are observed and projected changes in cold and heat waves and droughts (Ch. 2: Our Changing Climate, Key Message 7) for the nation. A study for the Southwest1 discusses trends and scenarios in both cold waves and heat waves. Climate factors contributed to increases in wildfire in the previous century. In mid-elevation conifer forests of the western United States, increases in spring and summer temperatures, earlier snowmelt, and longer summers increased fire frequency by 400% and burned area by 650% from 1970 to 2003.13 Multivariate analysis of wildfire across the western U.S. from 1916 to 2003 indicates that climate was the dominant factor controlling burned area, even during periods of human fire suppression.86 Reconstruction of fires of the past 400 to 3000 years in the western U.S.87,88 and in Yosemite and Sequoia National Parks in California89,90,91 confirm that temperature and drought are the dominant factors explaining fire occurrence. Uncertainties in future projections derive from the inability of models to accurately simulate all past fire patterns, and from the different GCMs, emissions scenarios, and spatial resolutions used by different fire model projections. Fire projections depend highly on the spatial and temporal distributions of precipitation projections, which vary widely across GCMs. Although models generally project future increases in wildfire, uncertainty remains on the exact locations. Research groups continue to refine the fire models. There is high confidence in this key message given the extensive evidence base and discussed uncertainties. Beginning in the 1910s, the Federal Government developed a national policy of attempting to extinguish every fire, which allowed wood and other fuels to over-accumulate103 and urban development to encroach on fire-prone areas. These changes have also contributed to increasing fire risk. 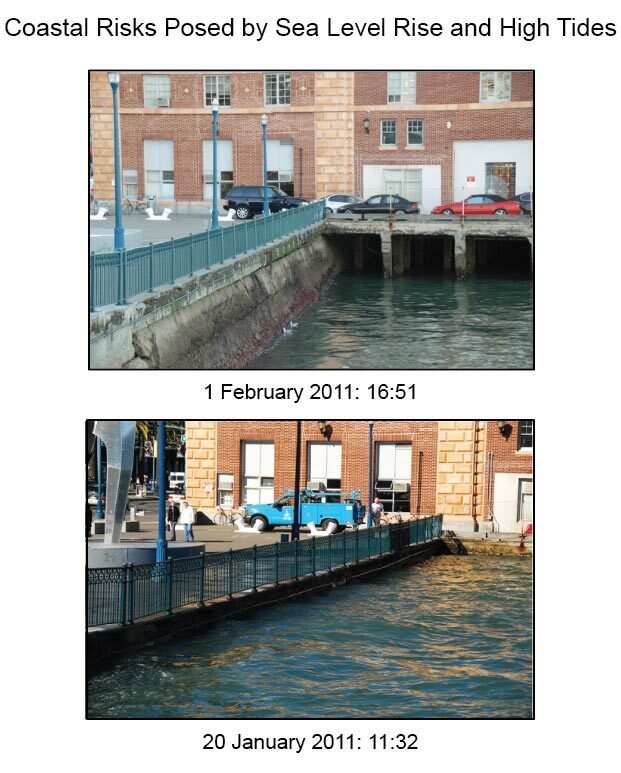 In the last 100 years, sea level has risen along the California coast by 6.7 to 7.9 inches.111 In the last decade, high tides on top of this sea level rise have contributed to new damage to infrastructure, such as the inundation of Highway 101 near San Francisco and backup of seawater into the San Francisco Bay Area sewage systems. The California state government, through its Ocean and Coastal Resources Adaptation Strategy, along with local governments, is using new sea level mapping and information about social vulnerability to undertake coastal adaptation planning. NOAA has created an interactive map showing areas that would be affected by sea level rise (http://www.csc.noaa.gov/slr/viewer/#). There is excellent agreement regarding the urban heat island effect and exacerbation of heat island temperatures by increases in regional temperatures caused by climate change. There is abundant evidence of urban heat island effect for some Southwest cities (for example, Sheridan et al.127,128,129), as well as several studies, some from outside the region, of the public health threats of urban heat to residents (for example, Ch. 9: Human Health,130,131). Evidence includes observed urban heat island studies and modeling of future climates, including some climate change modeling studies for individual urban areas (for example, Phoenix and Los Angeles). There is wide agreement in Southwest states that increasing temperatures combined with projected population growth will stress urban water supplies and require continued water conservation and investment in new water supply options. There is substantial agreement that disruption to urban electricity may cause cascading impacts, such as loss of water, and that projected diminished supplies will pose challenges for urban cooling (for example, the need for supplemental irrigation for vegetation-based cooling). However, there are no studies on urban power disruption induced by climate change. Key uncertainties include the intensity and spatial extent of drought and heat waves. Uncertainty is also associated with quantification of the impact of temperature and water availability on energy generation, transmission, distribution, and consumption – all of which have an impact on possible disruptions to urban electricity. Major disruptions are contingent on a lack of operator response and/or adaptive actions such as installation of adequate electricity-generating capacity to serve the expected enhanced peak electricity demand. Thus a further uncertainty is the extent to which adaptation actions are taken. 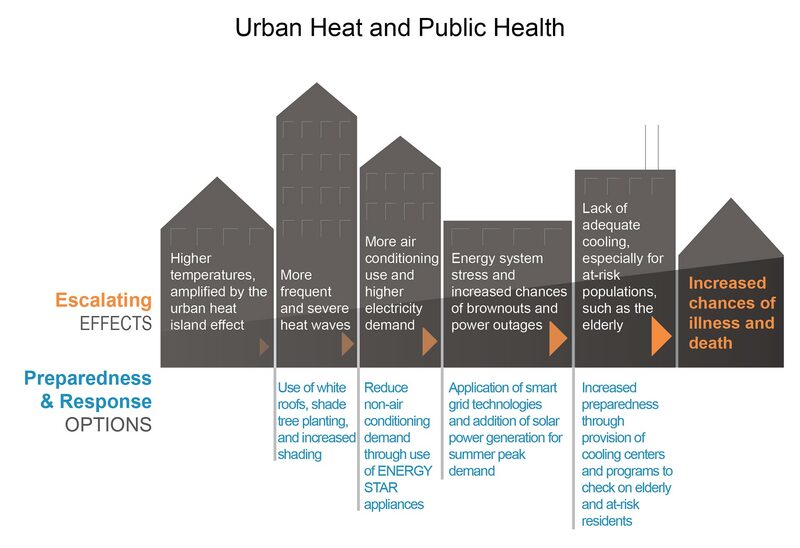 The urban heat island effect is well demonstrated and hence projected climate-induced increases to heat will increase exposure to heat-related illness. Electricity disruptions are a key uncertain factor, and potential reductions in water supply not only may reduce hydropower generation, but also availability of water for cooling of thermal power plants. Based on the substantial evidence and the remaining uncertainties, confidence in each aspect of the key message is high. The Southwest has the highest percentage of its population living in cities of any U.S. region. Its urban population rate, 92.7%, is 12% greater than the national average.136Increasing metropolitan populations already pose challenges to providing adequate domestic water supplies, and the combination of increased population growth and projected increased risks to surface water supplies will add further challenges.133,132,134 Tradeoffs are inevitable between conserving water to help meet the demands of an increasing population and providing adequate water for urban greenery to reduce increasing urban temperatures.